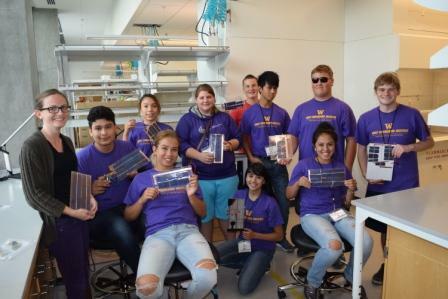 August 2015 — For the second year, the Clean Energy Institute teamed up with the UW College of Engineering’s Early Engineering Institute (EEI), a free, four-day residential summer program for high-achieving 9th and 10th grade students. This year’s group of ten early engineering students learned about solar energy and production from CEI education director Shaun Taylor along with Katie Corp, a second year chemistry graduate student (PhD track) in Dr. Cody Schlenker’s lab and Dr. Alexander Uhl, a postdoctoral research associate with Dr. Hugh Hillhouse’s lab. Each student was given a packet of solar cells and soldering materials. They designed a small solar panel following the engineering design cycle, assembling a prototype, debugging and finally encasing them in plastic. They learned how to solder, and how to work with delicate silicon cells, and finally produced working mini-solar panels. “It was wonderful to watch these students’ attitudes change over the course of only two, three-hour sessions,” Corp said. “At first they seemed uninterested, perhaps because it wasn’t their first choice of activity for the Engineering Institute. The program is designed to strengthen students’ math and problem solving skills, prepare students for applying to college, increase students’ awareness and understanding of careers in engineering, and increase students’ confidence through self-exploration, leadership and confidence-building activities. EEI gives students the chance to live and dine on-campus in a residence hall, visit real engineering labs across all disciplines, and study in engineering classrooms. These activities are all designed to expose and prepare students for advanced math and problem solving skills, which they will need upon entering into their next grade level. It also allows graduate students at CEI the opportunity to share their excitement for science and the urgency for new, clean, renewable energy sources. For more on the Early Engineering Institute visit the UW College of Engineering.